Even though CryptoSolarTech was aiming at building a crypto mining facility powered by solar energy in Southern Spain, it seems as if the project is no longer going to be developed. A local IT Lawyer shared via Twitter a part of the statement from the company, where they argued that the decision of the French venture capital fund Montbrun Private Capital to withdraw their investment is no longer allowing the project to run in a successful manner. Apparently, this decision was preceded by the impossibility to obtain proper licensing for their activity in the specific location they had planned beforehand. The lawyer showed his relief for the fact that the funds will be returned to investors, although he also mentioned that he saw the situation coming. CryptoSolarTech is promising to return in no more than 60 days the funds to the ICO investors who bought tokens prior to the 19th of February, when the announcement was written. 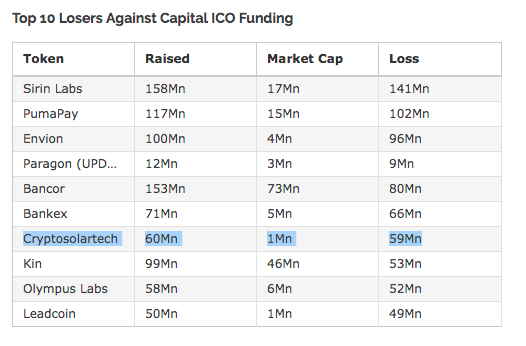 Do you still believe in ICOs?